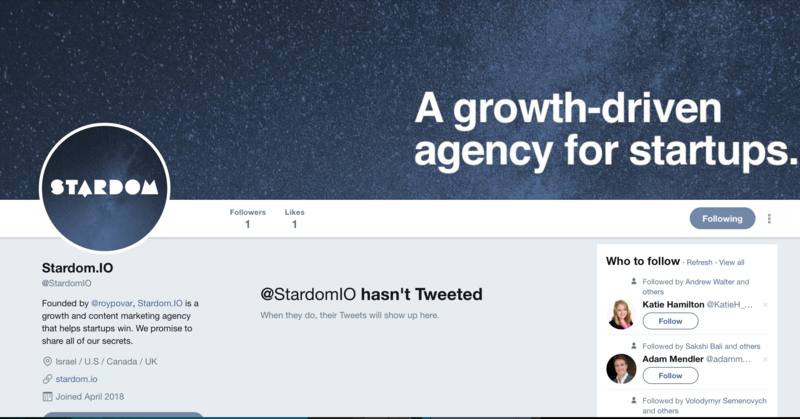 As we’re gearing up towards Stardom.IO official launch, there’s one big question I’ve yet to answer – how will we structure our marketing strategy. Stardom.IO has been around unofficially for the last year or so. Working with some big clients such as Taboola, PowToon, EatWith, CloudEndure and more. So far, our clients came to us through Word of Mouth or by leveraging my personal brand. We’ve never done any marketing for it, but now as we plan to scale our activities, it’s time build the agency’s own brand identity. When I come to plan the marketing strategy for the agency I ran into a dilemma – many of the strategies and topics apply both to my personal brand marketing as well as the agency. Should it be a Stardom show or a Roy Povarchik show? Which Youtube channel will host it? Is it possible that by marketing my agency I’ll be cannibalizing on my audience and brand value? Is it actually cannibalizing if both channels lead to same sales funnel? This means I keep my personal brand as a key content creator, but I talk a lot about Stardom and what we do. The best example of this strategy is obviously Gary Vaynerchuk. Gary built his agency’s traction channel based on his personal brand, and over time leverage that attention toward the different Vayner-Outlets. While originally I was excited about this strategy (as I’m a huge fan of Gary) I came into two main obstacles. First, “Vaynerchuk” and Vaynermedia” are automatically associated Povarchik and Stardom… not so much. Second, the type of content that needs to be created to build real traction for startups versus brands. Gary is a master marketer, no doubt, and I believe a lot of brands are looking up to him, but I don’t think they care about the Vaynermedia accounts at all. Only Gary’s. The content the VaynerMedia accounts put out – have no value if they’re not supported by Gary’s presence. It’s not a place where you go to get educated about being a better marketer; it’s not even where you go to learn what are the latest marketing trends. You follow Gary for that. For me, this means these channels don’t provide any real value of their own, and they are actually “luxury” channels. My target audience – Startup marketers, growth hackers and CEO’s tend to follow more channels that provide them value. They need to either learn something through my content or at least feel we’re smart enough that they’ll be happy to let us take charge of their growth or marketing efforts. Stardom’s marketing channels have to provide that value; if not, there’s no reason for their existence. Also, being a marketing agency with no marketing channel of its own… well, it doesn’t sound like an agency I’d trust. Also, It’s more fun and easier for me to create stuff under my name than anything else, and of course – it’s already there and easy for me to leverage. There’s a reason why every major marketer uses this strategy. The idea is to build one brand – and leverage it towards the agency in step 2. This means that’ll I change my personal brand strategy into more about “entrepreneurship, inspiration and building businesses’ and lend my ‘professional’ content to Stardom.IO. In the long term, this is what feels right. I want Stardom to build its own presence and be able to gain traction on its own. My belief is that the best thing for every agency to do if it wants to stay on top – is to make sure it practices what it preaches. New Instagram account with zero content and followers. New Twitter account with zero content and followers. Build traction. No history to rely on. I think of social media profiles as real estate. Make smart investments now, and you’ll see a decent ROI in the future. Building Stardom.IO’s marketing channel is a smart investment for the future. Also, I think it’s really important for us to practice what we preach. While trying to make my decision on which approach to take, I was looking through some of the most “notable” marketing agencies out there. Most of their social media channels look pretty bad. I want ours to do better. I’m going to build both my personal brand and Stardom’s – but I’m going to focus on Stardom’s channel for a while and build initial traction to them. To make sure it’s not just a replica of my personal strategy, and to make it scaleable, I’m going to manage & strategize our channels with Christina, our social media manager. Our main goal is that at some point the entire process will be hand over to her. I’m going to use this opportunity to experiment with building traction to our social media channels from scratch and make the process as transparent as possible. We’ll post a monthly update on what we did, what worked, and what we’ll do next every month. Maybe even set up a dashboard to make it easy for everyone to track. Our initial channels will be Linkedin, Facebook, Twitter & Instagram but we won’t give them all the same attention in the first quarter. Our first goal is to get to 250 followers on each of the platforms and then focus on 1-2 that will want to boost traction on. Right now, we haven’t optimized or started posting to any of the new Stardom.IO channels. We will be finishing our content strategy soon, and we’ll start then. Do you know any startups who’d like to follow us closely as we build our social media channels? Share this post with them!